Piña was born of the desire to create a new seating concept, combining comfortable woven steel rods with solid wooden legs. 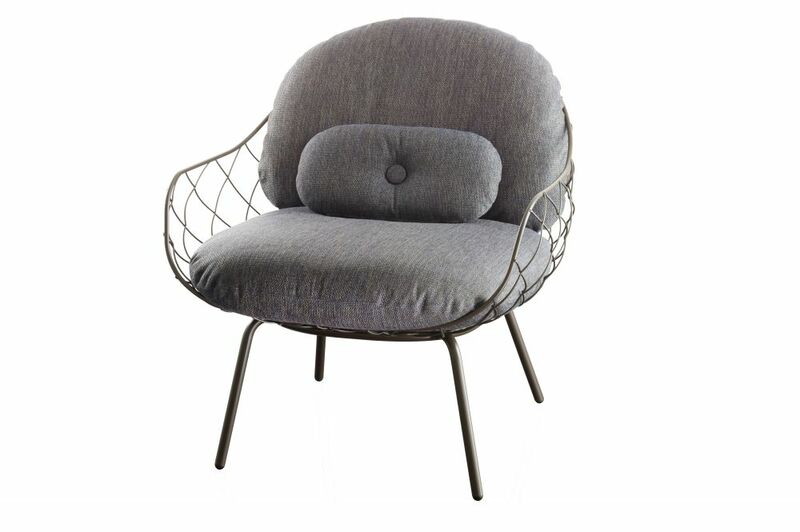 With the weight of the seated body, the rods create a distinctive “capitonné effect” on the back of the cushion, adding to the very special character of this design. This very simple yet unique idea has given rise to an entire family of furniture: in addition to this armchair, the Piña collection includes a comfortable low chair with footrest, a handy table and an amusing rocking chair. Suitable also for outdoor use (the version with steel tube legs treated for outdoor use), the Piña collection is rendered even more versatile by the choice of different finishes, perfect for every style and setting. Spanish artist-designer Jaime Hayón was born in Madrid in 1974. After studying industrial design in Madrid and Paris he joined Fabrica – the Italian design and communications research centre founded by Benetton – in 1997, directing the design department until 2003. Hayon set up his own studio practice in 2000, and dedicated himself fully to his personal projects from 2003 onwards. Today he is one of the most acclaimed creators across the globe. Hayon’s esteem and knowledge of artisan skills and his inherent creativity have allowed him to push the boundaries of many media and functions, resulting in collections for a diverse range of clients. His interest in the conservation of craft skills has led his path to converge with those of high-end traditional companies who care about the evolution of their work. He has created furniture ranges for Fritz Hansen, Magis, Established and Sons, Bisazza, B.D. Barcelona, Se London, Bernhardt Design, Ceccotti and Moooi. Hayon has also designed various lighting collections for Metalarte and in collaboration with Swarovski and Baccarat. He has created accessories for Piper Heidsieck, Gaia and Gino and The Rug Company. In 2013 he designed his first wristwatch collection for the new Swiss watch brand OROLOG. These collections have put Jaime at the forefront of a new wave of creators who blur the lines between art, decoration and design, and of a renaissance in finely-crafted, intricate objects in the context of contemporary design culture. In addition to his acclaimed intramurals for Madrid’s La Terraza del Casino restaurant and Camper footwear stores, Jaime is currently working on interiors for leading hotels, restaurants and retail establishments around the world that have become platforms for the creation of special objects and both functional and non functional elements. His work has appeared in the most prestigious art and design publications worldwide, and he has won numerous awards. Time magazine declared Hayon to be one of the 100 most relevant creators of our time, and Wallpaper magazine has also listed him as one of the most influential creators. With offices in Italy, Spain and Japan, Hayon’s main interest is to keep finding new perspectives and challenges.